About a quarter of LGBT men may be getting Happy Fathers’ Day wishes today. According to the Pew Research Center’s new survey of LGBT Americans, 23% of LGBT men are fathers, including 16% of gay men and 32% of bisexual men. LGBT men are significantly less likely than men in the general public to be fathers: Seven-in-ten American men are fathers, according to Pew Research Center polling. And, LGBT women are about twice as likely as LGBT men to be parents: 48% are mothers, including 31% of lesbians and 59% of bisexual women. Not surprisingly, younger LGBT men are less likely to be parents (just 13% of 18-44 year old LGBT men are fathers compared with 34% of those ages 45 and older), but are more likely to say they’d like to have children in the future (23% vs. 3%) . 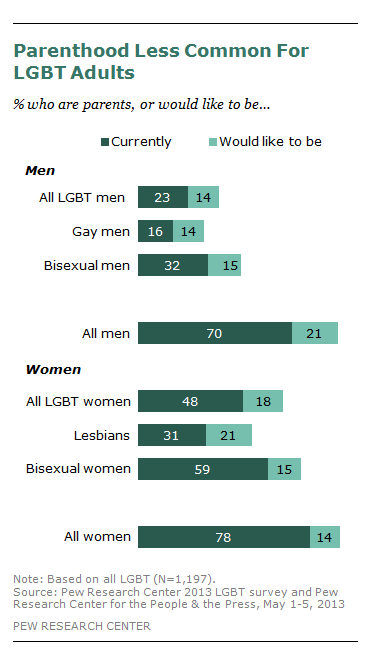 In addition to the 23% of LGBT men who are currently fathers, 14% say they would like to have a child someday.